It's not enough to say that the Teenage Mutant Ninja Turtles reboot is kind of a lousy movie. You want to be able to draw some kind of lesson from its crapness, or at least pick through the debris for some hint of what it could have been. To that end, here are all the ways that TMNT 2014 fails. The thing is, Teenage Mutant Ninja Turtles has some good ambitions. The cast is pretty solid. The idea of doing the Turtles as motion-capture characters, in the vein of an Andy Serkis character or Mark Ruffalo's Hulk, was a decent one. This film tries to make sense of the Turtles' origins, while also keeping things absurd and zany like the classic TV cartoons and the live-action movies. Director Jonathan Liebesman previously helmed Battle Los Angeles, which I liked a lot for what it was. So this movie could have been something pretty decent — what happened? Let's try and break it down, with minimal spoilers. It fails as a reimagining of a classic comic and cartoon. Any time you revamp a beloved series like TMNT, you have to please the die-hard fans while also appealing to newcomers. 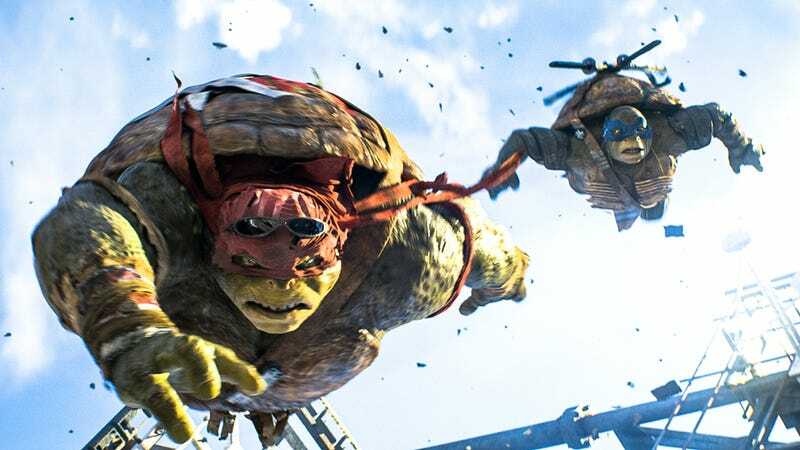 And unfortunately, this film feels like it's not quite going to do either of those things — I'm guessing the redesigned turtles are too weird-looking, and the storyline is too generic and off-base, to please long-time Turtle-lovers, while neophytes will wonder what the fuss was about. It's the classic problem: this movie goes out of its way to shoehorn in all of the trappings (pizza, ninjitsu, "heroes in a half shell," etc.) but misses the core of what made people love the Ninja Turtles back in the day — their basic weirdness and silliness. Great care is taken with the surface, but the core is completely empty. Not only that, but this new TMNT tries way too hard to get humor out of pointing out how ridiculous the concept is — a lot of the most forced "funny" bits involve characters laboriously pointing out the lunacy of these guys not only being turtles but also ninjas, and mutants too. Which... after a while, you kind of want to just roll with the concept instead of constantly having it undermined in the service of "humor." It's also not charming. In all their previous incarnations, the Turtles have had a certain lovable goofiness. Especially in their TV cartoon incarnation. Along with their rat sensei, Splinter, they're sort of wacky and engaging, and that's the point of all the stuff about pizza and catch-phrases and turtle power and stuff. In this new version, they feel drained of a lot of their personality, and actually kind of creepy. The banter often feels like it's trying too hard, and the running gag where Michelangelo hits on Megan Fox (everybody hits on Megan Fox in this movie) is just jarring. The motion-capture doesn't feel like it worked out, because there's a bit of uncanny valley going on, and their faces feel a bit too human. Even beyond charm and friendliness, this movie just has no heart. It's one of the most heartless films I've seen in ages. The action is almost unwatchable. Liebesman relied a lot on shaky cam in Battle Los Angeles, but here he doesn't have that luxury because he's dealing with 3D and a ton of CG and mocap stuff. And he doesn't quite seem to have a handle on how to shoot the action stuff that comprises the last 45 minutes of the movie. There are a lot of scenes where I wasn't entirely sure where the turtles are supposed to be in relation to each other and the people they're fighting, and the overall geography of the fights felt muddled rather than exciting. The movie's big climax tries to win you over with a couple of tricky sight gags, but the lack of clarity just makes them added sources of confusion. And to add to these problems, the CG looks distinctly ragged around the edges in some of the big action set pieces, especially one big chase scene. I couldn't help wondering if someone at the studio had seen a rough cut of this film and decided not to spend the extra money to polish up the CG effects. None of it makes any sense at all. Again, without a lot of spoilers, the plot is the kind of nonsense where you actually notice the plot holes as you're watching — as opposed to when you're in the parking lot after leaving the theater. Not that that's a big deal in this kind of movie, but it's a problem when you're supposed to care about what's going on, or buy into the Turtles' plight. And the movie's early attempts to make you sympathize with April O'Neil (played by Fox) are especially incoherent — basically, the movie takes two very different versions of April, from two different incarnations of TMNT, and smushes them together to make a character whose motivations and storylines are completely muddled. She's already pretty undermined before we watch her get hit on for two hours. There's no sense of place. OK, so this sounds like a minor complaint, but it's actually not because it gets to the heart of what's wrong with this film. Liebesman has these aerial shots, flying over the tops of buildings, which he inserts in between every other scene of the film for the first hour, trying to convey that "this is New York, we're in the big city." Liebesman apparently filmed a lot of the movie in Manhattan. But there's no sense of the geography of the city, or of this as a real place. The characters are constantly zipping back and forth from downtown Manhattan to a mansion in the middle of nowhere, and one major plot point is that there's an entrance to the New York sewers in an empty field surrounded by miles and miles of snowy hills. The city never feels like a real place, the way Christopher Nolan's Gotham does. But even more than that, the personality of New York totally fails to come across, and that's a big reason why the characters feel dislocated. Especially since we're supposed to believe that New York has been terrorized by the Foot Clan for months, and April O'Neil works at a local TV news show. The Spider-Man movies (both Raimi and Webb) have made a point of creating a sense of New York as a character, and as Spidey's city, and that's sorely missing here. Bottom line: It's just terribly dull. It's not "so bad it's good," or epically, memorably bad. It's mostly super-forgettable. But I feel like there was an opportunity to make something entertaining, and it was squandered by a movie that's simultaneously trying too hard and not trying hard enough.